The workout is in the wear. Turn your everyday actions including walking, running, climbing stairs, lifting, sitting and standing into healthy training exercises with the SIXPAD Training Suit. For wearing comfort, the suit uses a fabric that fits snugly to the skin, and is designed to effectively develop targeted muscles. While wearing the training suit, your everyday natural actions encounter a moderate amount of resistance to increase your muscle activity. No matter how busy your schedule is every day, you can begin a healthy workout just by wearing the SIXPAD Training Suit. Work on developing your transverse abdominal muscles. Train the muscles with the High Power Belt which provides strong compression to apply pressure against your abdominal muscles. These muscles push back on the compression resulting in an ideal training exercise. At the same time, the compression and shaping function of the training suit will help you achieve a beautiful waistline. Moreover, the support rods on the rear help maintain a beautiful posture. The transverse abdominal muscles push back against the pressure created by the strong compression. Measure your waist and hips and select the corresponding size. Measure your upper arm and wrist and select the corresponding size. 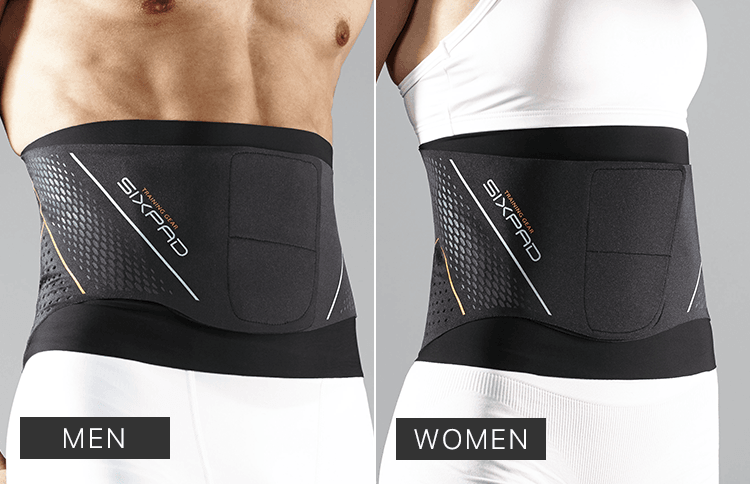 The exterior belt helps shape your waistline while training your transverse abdominal muscles. The seamless interior consists of a difficult-to-stretch High Power Zone that is comfortable to wear. www.sixpad.uk and are owned and operated by MTG UK CO. LTD. We respect the privacy of our customers and visitors to our websites. For the purpose of the Data Protection Act 1998 (the Act), the data controller is MTG UK CO. LTD. of Fleet House 8-12 New Bridge St, London, EC4V 6AL. This Notice of Privacy Practices (“Notice”) describes the privacy practices we follow in connection with these websites, including our mobile applications and related consumer services (collectively, the “Services”). By using our Services and/or registering as a www.sixpad.uk member, you are accepting the privacy practices described in this Notice and consenting to our collection, use and disclosure of your personal information as described below. The personal information we collect about you may include, for example, your name, www.sixpad.uk passwords, postal shipping and billing addresses, telephone numbers, email addresses, social networking information (such as user names, handles, and friends lists), information about contacts provided by you or information in your address book, demographic information (such as date of birth, age and gender), photos you send us, products you may select as favorites and share, purchase history and location information (often from the device on which you access the Services). You may also submit additional personal information to us in other ways, such as participating in online surveys, promotions, contests and sweepstakes and other offerings made available through our Services. We may combine information we receive from third parties with the information we receive based on your use of the Services and any other interactions with us. We do not store Credit Card details or share sensitive information with 3rd Parties. This includes payment information (including credit card numbers or online payment services numbers), financial information (such as bank account numbers). In addition to the information you submit to us on these websites or when using the Services, information regarding your use of and interactions with our Services is collected and/or aggregated by or on behalf of www.sixpad.uk, often through the use of automated means. Such information may include, for example, data that we gather and store about your visit to and use of the Services, such as your IP address and the location of your IP server, device IDs, device type, Wi-Fi connection information, geo-location data, product search history, type of browser and operating system used, date and time you access the Services, pages you visit, and if you came to the Services from another website, the address of that website. Cookies and web beacons are sometimes used to collect and track this customer usage information. “Cookies” are small identifiers sent from a web server that are stored on your device’s hard drive for the purpose of identifying your browser during interactions on websites or storing information or settings in your browser. A “web beacon,” also known as an Internet tag, pixel tag or clear GIF, links web pages to web servers and their cookies and may be used to transmit information collected through cookies back to a web server. We can also use web beacons to tell if you have opened or acted upon emails that we send you. 8. to protect, investigate, and deter against fraudulent, unauthorized, or illegal activity and to comply with legal information requests, applicable legal requirements and our policies and practices. Affiliates, service providers, business partners, suppliers and sub-contractors for theperformance of any contract we enter into with you. We may include applications from third parties on these websites or through our Services, which allow interaction or content sharing by users. Some of these mini-programs provide specific services or content from a third party, such as a Facebook “Share” or “Like” button, and are visible to you when you visit our Services. Your interaction with these programs typically allows the third party to collect some information about you through cookies they place on your device and other tracking mechanisms. In some cases, the third party may recognize you through its cookies even when you do not interact with their application. Please visit the third parties’ respective privacy policies to better understand their data collection practices and controls they make available to you. If MTG UK CO. LTD. or substantially all of its assets are acquired by a third party, in which case personal data held by it about its customers will be one of the transferred assets. The Services may allow you to connect and share your actions, comments, content, and information publicly or with other people you specify. You may also connect to and share your information on third party social media platforms, websites, applications, and services through “plug-ins,” widgets, buttons, and other third party features on and connected with our Services. You may also share with www.sixpad.uk contact information of friends and people in your address book so that we can help you invite others to become www.sixpad.uk members or let them know about special offers and help facilitate deliveries. Please be mindful of your own privacy needs and those of others as you choose with whom to connect, what you share with us and others, and what you make public. We cannot control the privacy of information you choose to make public or share with others. We also cannot control and are not responsible for any third party sharing services or their actions including the data that they collect from you and your device or how they use such data. Please review their privacy policies to understand their privacy practices. MTG UK CO. LTD. is committed to securing clients and data subject’s personal information. We have deployed appropriate physical, electronic and managerial procedures to safeguard and secure this information. These measures include but are not limited to firewalls, intrusion detection and other automated security software. You may access and update your account information at any time after signing in to the Services by visiting your Account Profile. To help us maintain accurate, current and complete information about you, please submit only true, accurate and complete information whenever you provide personal information to us, and promptly update your account whenever it changes. For additional assistance, please contact us in in the manner specified below. We may update this Notice to provide clarification or notice of changes to our practices. If we make changes, we will revise the date at the bottom of this Notice. If we use personal information in a manner that is materially different than described in this version of this Notice, we will obtain your consent if required by applicable law. If you have any questions or comments about this Notice or if you would like us to update information we have about you or help you adjust your preferences, please contact us via our contact page . ※ Products shown in photos are size M.
Get up to 25% off the original price every month! A special offer on our gel sheets price with a 25% discount off the original price. Your gel sheets will be delivered free of charge every month. No need for bothersome orders! Get your gel sheets delivered automatically to your door every month. Without the hassle of re-ordering. Always make sure to use genuine gel sheets. If non-genuine gel sheets are used even once, the warranty will no longer apply to the product. Please note that we shall bear no responsibility whatsoever for any problems that result from using anything other than genuine gel sheets. For the latest deals, promotions and SIXPAD news, please sign up to our newsletter today! COPYRIGHT (C) 2019. MTG UK CO. LTD. ALL RIGHTS RESERVED.